In the midst of the Dominion threat to Earth, Sisko unconvers a Starfleet coup to take control of the Federation. 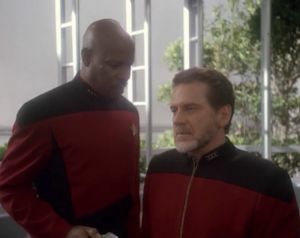 Captain Sisko has a moment of soul-searching and doubt about turning in those involved in the coup, which is something Captain Picard would never have had to deal with. The actor who plays the Federation president has about as much acting talent as a plastic cup. Odo uses a Vulcan neck pinch. It would have been really wise to bring the Defiant in under cloak. It wouldn't be the first time they've used the cloaking device in the Alpha Quadrant. This two-parter is the first time the show goes directly against Roddenberry. He expressly forbid the idea of a Starfleet military coup on Earth back when they were pitching TNG's "Conspiracy," which wound up being less about a coup and more about an alien infiltration of Starfleet. "Homefront" and "Paradise Lost" is extremely similar, but instead of being about a coup that turns out to be an alien invasion, it's an alien invasion that turns out to be a coup. "Homefront," while laying the groundwork for its follow-up, does a good job showing us the shades of grey, building on ideas that TNG tackled in episodes like "The Drumhead." Unfortunately, as in DS9's earlier two-parter, "Past Tense," the second episode loses a lot of the moral ambiguity, forcing a more black-and-white theme to present itself. Granted, it's not as cut and dry as "The Drumhead," as the episode makes it very clear that there are Changeling infiltrators at work on Earth. While I don't like how they turned the character of Admiral Leyton into an almost cartoonish villain by the end, I appreciate what they were trying to do. DS9 will continue to tackle this kind of subject matter, and gets better and better at it as the show goes on, culminating in episodes such as "In the Pale Moonlight" and "Inter Arma Enim Silent Leges."